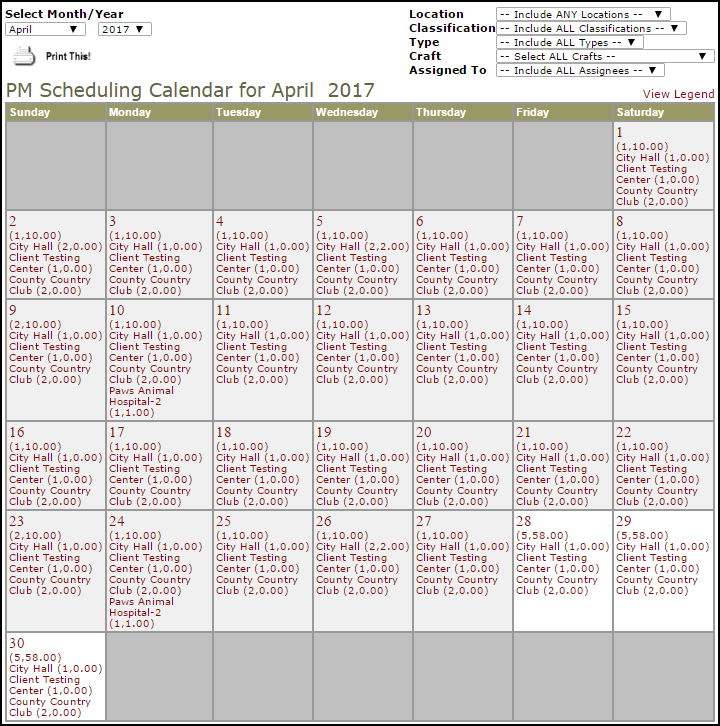 The Calendar allows you to view past and upcoming PM work that is currently scheduled by Location, Classification, Type, Craft, or Assigned To. You are able to view the Calendar in a Month or Day view. Click on the Calendar tab at the top of the page. The default calendar view is for the current month. The locations listed on the calendar are the locations that will appear on PM work orders. *Note: The numbers in parenthesis next to the Location name are the total number of work orders and the estimated labor hours, respectively. To the right side of the page, you can filter the calendar view according to Location, Classification, Type, Craft, and Assigned To. *Note: The calendar will automatically refresh when you select a filter. To view a different month, select from the Month/Year drop downs to the left side of the screen. Click a date on the calendar to see additional details regarding your schedules. You are able to print your schedule details into a PDF or Excel on this page. Click Print This! to view a list of upcoming PM work for the selected month. In this list you will see important PM details such as Schedule Description, Location, Date Generated, and the Status of the last generated PM work order. After you have viewed the information, you can print it if needed.